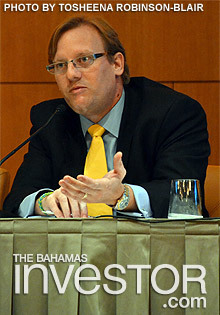 Miami, Florida–Billions of dollars held by American financial institutions for Latin American clients could potentially make its way to The Bahamas, said Minister of Financial Services Ryan Pinder during a Bahamas Financial Services Board (BFSB) Landfall event held at the Conrad Hilton in Miami November 7. “We are forecasting significant exit mobility of capital,” said Pinder. Pinder, a tax attorney, says there’s one estimate floating around that some $200 billion is under management by Miami financial institutions for Latin American clients. “It’s a significant amount of capital that could potentially be mobile,” he told the intimate gathering of money managers and intermediaries. The BFSB-backed Bahamas Landfall events present a holistic and comprehensive view of The Bahamas to intermediaries and investors. Similar Landfalls have been held in such destinations as Zurich and London. “We chose Miami this year for two major reasons, to strengthen historic ties with Miami advisors and because of the increasing importance of Miami as a hub for Latin America,” said Aliya Allen, the chief executive officer and executive director of BFSB–a quasi-government agency whose job it is to promote the nation’s second largest industry to the world. “We thought that there were synergies that could be exploited between what you offer and what we offer in terms of wealth management services,” Allen told the select gathering during the brief presentation, which took the form of a panel discussion. Pinder noted that The Bahamas already has products developed specifically for the LatAm market. 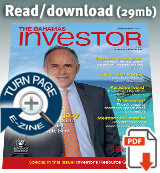 Smart Fund 007 is the newest model designed to accommodate investors through a flexible, but regulated fund structure for both institutional and individual investors. Morgans Hotel Group Co (NASDAQ: MHGC), which has partnered with Baha Mar to create the Mondrian Baha Mar hotel at the resort, recently reported financial results for the quarter ended September 30, 2013.